From preschool to graduate school, student learning is intrinsically linked to the effectiveness of their teachers. An online master's degree in education can give future or experienced teachers the tools and knowledge they need to promote success in the classroom. These convenient programs combine pedagogical theory with hands-on experience to prepare graduates to work with students of various age groups and backgrounds. 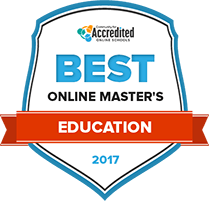 This guide to online education master's degrees highlights common program admissions and graduation requirements; projected teacher earnings and career outlooks; and valuable educator resources. Many schools offer online master’s degrees in education. With so many options to consider, it can be difficult for students to research and identify potential programs. The rankings below—based on factors like student-to-faculty ratio, job placement services for graduates and student loan default rates—provide information students need to identify the best teaching programs to suit their needs. Educators and potential educators can pursue a wide range of master's degrees and certificates at Eastern Michigan University. Distance learners can complete many of the programs completely online. Students can schedule either group or individual appointments with advisors who are dedicated specifically to the College of Education. Clinical services include free school-based counseling clinics and campus counseling clinics, and students will have access to career services. There are a variety of resources available to assist students in their academic journeys, including the academic projects center, academic success partnerships and the Holman Success Center. The Teacher Education Accreditation Council All has accredited all teacher education and educational leadership programs at Hofstra University. Comprehensive support and resources include the Office of Educational Support Services and Office of Field Placement, both of which coordinate student teaching and other clinical experiences, and also provide support for teacher certification. Every year, the School of Education publishes the Literature and the Imagination Conference, and both graduate students and the surrounding community are served by The Reading/Writing Learning Clinic and iDesign Makers Space. The Department of Education has issued millions of dollars in grants for scholarships for special education faculty. The Judith Herb College of Education offers three unique College Credit Plus program, two of which result in master of education and science degrees, and the other culminates in a master of education and arts degree. Available concentrations include biology, chemistry and English. These online programs can be finished in a year and a half, including a one-week, on-campus summer experience. There are also a variety of traditional master's degrees in education, some of which are also available online. Student services include the career center, research opportunities, the Learning Enhancement Center and library services. Students pursuing a master's degree at the Wright State University Graduate School will have access to the university's research facilities, and students will have close contact with a dedicated academic advisor as they continue their education. Students can get involved with seven coordinating student organizations at the graduate level, including the Graduate Student Assembly, which works closely with the Student Government Association. Students will participate in an on-site graduate student orientation, and will also have the ability to participate in a variety of intramural sports, professional development activities and graduate student organizations. Graduate students can pursue a wide menu of master's degrees through the Nova Southeastern University Fischler College of Education. Prospective students are invited to attend informative meetings that the university hosts across the country. The college, and all of its degrees and programs, is accredited by the National Council for Accreditation of Teacher Education. All programs apply theory and multi-modal approaches to real-world scenarios. The school maintains professional and academic partnerships around the world, and the alumni network includes tens of thousands of graduates. Coursework includes case studies, collaborative projects and original research. At Lesley University, students gain skills to advance their teaching careers. Skills, research methods and practical training that they receive also helps degree seekers to increase the likelihood that young children they teach will improve their learning. Programs that master's education degrees are awarded in are early childhood education, high school education, elementary education, special education, middle school education and arts in education. The curriculums are taught at the university's Cambridge, Massachusetts campus. Distance education options are also available. Lesley University is accredited by the New England Association of Schools and Colleges. Part-time and full-time class schedules help to make the degree increasingly flexible. Learning is not limited to a lecture hall or to the classroom in SUNY Buffalo State's master's in education programs. Adults enrolled in the degree programs can learn how to teach students at pre-school, elementary, secondary and postsecondary levels. Up to 17 graduate education programs can be pursued at SUNY Buffalo State. There's opportunity to teach abroad through the university's international outreach program. Additional newly designed programs that education majors could participate in are dietetics and adult education, teaching English to speakers of other languages, accelerated curriculum and instruction and early childhood and exceptional education. Although there are a variety of master's degrees to choose from, all require at least 30 credits and an overall grade of B or better. Most master's programs culminate either in a thesis or an extensive examination. The Syracuse University School of Education utilizes the MySlice platform, which graduate students use for a wide range of elements pertaining to their academic careers, including advising, enrollment, financial aid, meal plans and housing. Students can use MySlice to check their student account, modify or view religious observances, view transcripts, change or add personal information and view grades. The Graduate School of Education offers an large variety of concentrations and specialties that culminate in a master of education degree. Graduates will be able to pursue a number of occupations both inside and outside the classroom. Many classes are offered either online or in the evening in order to accommodate varying student schedules. Many programs include field experience in different real world environments, and some programs even offer the opportunity to study abroad. Students can study either full or part time, with full-time enrollment requiring at least six credits. Anything less than six credits is considered part-time enrollment. Master's students must complete all coursework in six years. Several pathways to a graduate teaching or education administration degree are available at Canisius College. These programs are for adults who are serious about teaching. Outcomes are specific to the concentration. Special education, school counseling, physical education, literacy, education technologies and emerging media and educational leadership and supervision are some concentrations that students can focus on while they pursue a master's in education degree. Concentrations like differentiated instruction are for students who possess a teaching certification. To get a clinical mental health counseling degree, students may need a separate psychology degree and license to practice at certain organizations. The right resources make school research easier. This tool helps students interested in online master's degrees in education locate programs by cost, size, and school type. Filter the results according to your degree needs to help find the right school for you. Online education master's degrees are rigorous programs generally completed within two years. Students learn advanced education concepts that build on their previous studies and work experience to sharpen teaching skills and become potential leaders in the field. The following sections outline program milestones and admissions processes for online master's in education programs. The admissions process for an online criminal justice master's degree program begins with successful completion of an accredited undergraduate program. Students must major or minor in criminal justice or complete studies in a closely related field. They must be prepared to submit letters of recommendation from professors that taught criminal justice-related classes and provide examples of success throughout their undergraduate program, whether this is was in the form of successfully completed simulation crime investigation projects or well-written essays and reports. Education applicants should have a bachelor's degree in a related field, but some schools admit students with degrees in other disciplines if they intend to teach that subject. Online master's students in education may be required to earn a certain score on the Graduate Record Examination (GRE), Miller Analogies Test (MAT) or the Academic Literacy Skills Test (ALST) before they apply to a program. Those who speak a first language other than English may have to take the Test of English as a Foreign Language (TOEFL). Prospective education students should submit letters of recommendation from undergraduate professors and employers that can speak to their teaching skills and academic abilities. Generally, schools expect two to four references with each application. Applicants who have professional teaching experience can highlight their skills and expertise on their resumes; students without professional experience can use this opportunity to highlight other relevant achievements or experience. Some online schools allow students to specialize their coursework to certain career goals. These concentrations might include instructional design, educational leadership, or a specific grade level or topic area. Practicing teachers pursuing online master's degrees in education usually have experience administering student assessments. On the graduate level, they're expected to increase their competencies in this area by learning advanced data-driven techniques for evaluating student success, designing instruction and establishing learning standards. Education students gain an advanced understanding of learning and teaching theories, and how they apply to different student populations and learning needs. Online master's in education programs' curricula are designed to prepare students for state licensing examinations to become teachers, or enter related education professions. Lesson plans are the building blocks successful learning experiences and outcomes. Online master's in education students learn how to identify students' needs, design effective curricula and adjust plans as needed. Courses highlighting fundamental teaching theories are critical for education master's students; practical training requirements help them apply those principles in real-world settings. Students are generally required to complete a minimum number of student-teaching hours in the classroom. Education master's programs provide holistic teacher training by combining academic and hands-on learning. Graduation requirements ensure students mastered the skills and concepts necessary for effective teaching. Students may be expected to create a work sample that exhibits their ability to design and implement a multi-week curriculum based on the needs of a hypothetical student, classroom or school. Online master's degree in education programs sometimes require student theses outlining original, field-relevant research. Some students may need to orally defend their work on topics such as curricula creation, instructional planning or education policy. Internships give students practical training in environments relevant to their areas of specialization. Someone specializing in elementary education would complete student teaching hours in K-12 environment, for instance, while those specializing in educational leadership serve administration-related internships. According to the U.S. Bureau of Labor Statistics, high elementary, middle, and high school enrollments and expected teacher retirements will generate a six percent increase in demand for teachers of all types over the next several years. Graduates of online master's education programs can pursue other relevant positions, however, including the following. Community college instructors craft course curriculum, give lectures, and grade tests and homework. Unlike four-year college professors, community college teachers spend more time teaching as the expectation for published research is deemphasized. Instructional coordinators with educators to create the curricula and standards that teachers are expected to use in their classrooms. They may also train teachers, analyze student data to create an effective curriculum, evaluate teacher performance and recommend educational technologies. Postsecondary education administrators oversee specific operations at community colleges, four-year colleges and universities, and technical and trade schools. They may focus on areas like admissions, student affairs, the registrar's office or faculty research. Tasks might include creating promotional materials, planning graduation ceremonies, scheduling sporting events or reviewing prospective student applications. Instructional technology specialists facilitate the acquisition of technology in the classroom by evaluating technology needs, choosing technologies that complement a course's curriculum and ensuring educators use them effectively. Instructional technology specialists must also know how different student populations adapt to technology, from special education students to advanced learners. Successful educators consider developmental factors that impact learning when designing age-appropriate courses. Online master's degrees in education emphasize mental, physical, emotional and social development across several age groups. Whether students aspire to teach English, science or mathematics, there are specific methodologies they need to tackle those subjects effectively. Online graduate degrees in education teach subject-focused instructional and assessment techniques. Teachers must create and maintain a positive classroom experience for students of various races, cultures, academic abilities and temperaments. Skills that contribute to this include the ability to effectively discipline students, keep class records, communicate with parents and update lesson plans according to student needs. Educators who want to contribute to the knowledge base of the field must understand how qualitative and quantitative research methods work, and how to conduct research studies from the conception to completion. The following organizations provide additional information about the field and educator support services. School administrators have been represented by this association since 1866.The group helps school leaders by providing public policy support, leadership development programs, and professional certifications. This is a national teacher's union affiliated with AFL-CIO. Founded in 1916, this organization represents the needs of pre-K teachers through college professors, as well as other school personnel. Promotes excellence and professionalism among educators. Offers liability insurance, publications, scholarships and grants, and lobbying support to its members. The NEA acts on behalf of educators who work on the college level all the way down to the preschool level. The association provides education research reports and policy briefs, lesson plans, classroom management tips, annual meetings, and grants. Provides support to teacher educators by offering professional development, publications, and awards. This government agency creates policies designed to promote student excellence. In addition, the Department of Education disburses loans and grants to college students.